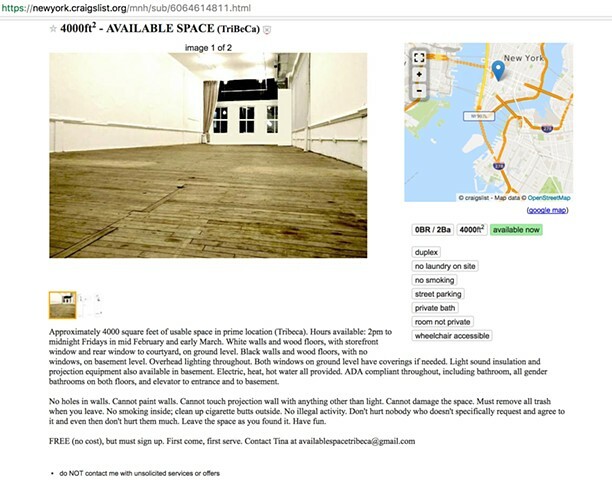 [Image Description: Desktop screenshot of a craigslist ad titled “400ft² - AVAILABLE SPACE (TriBeCa) with an image of a white walled room with wood flooring. To the right of the image is a map of manhattan with location marked downtown. The text in the ad reads: “Approximately 4000 square feet of usable space in prime location (Tribeca). Hours available: 2pm to midnight Fridays in mid February and early march. White walls and wood floors, with storefront window and rear window to courtyard, on ground level. Black walls and wood floors, with no windows, on basement level. Overhead lighting throughout. Both windows on ground level have coverings if needed. Light sound insulation and projection equipment also available in basement. Electric, heat, hOT water all provided. ADA compliant throughout, including bathroom, all gender bathrooms on both floors, and elevator to entrance and to basement. No holes in walls. Cannot paint walls. Cannot touch projection wall with anything other than light. Cannot damage the space. Must remove all trash when you leave. No smoking inside; clean up cigarette butts outside. No illegal activity. Don’t hurt nobody who doesn’t specifically request it and even then don’t hurt them much. Leave the space as you found it. Have fun. screenshot of Craigslist post offering Artists Space for public use.